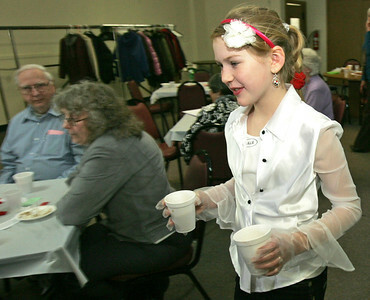 H. Rick Bamman - hbamman@shawmedia.com Girl Scout Lillie Korpalski serves coffee to seniors at the Senior Center in Crystal Lake Monday February, 20. Troop 421 of Crystal Lake hosted the lunch party for the seniors serving hot dogs, baked beans, potato chips and dessert. The scouts also performed musical numbers during the event. 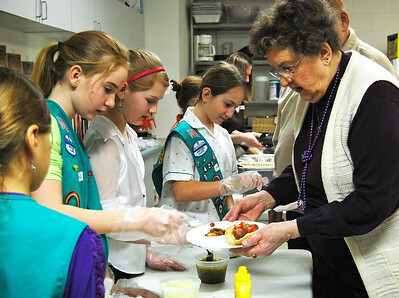 Kayla Wolf - For the Northwest Herald Memebers of Girl Scout Troop 421 of Crystal Lake from left Alexandrea Ciecierski, Haley Stiescak, Lillie Korpalski and Sky Wickersty (CQ) serve a meal to Bette Benson durning a lunch party at the Senior Center in Crystal Lake Monday February, 20.